Hass, Ruth Age 96, of Spirit Lake, Iowa, formerly of Minneapolis, was born July 28, 1922 in Lake Park, Iowa. 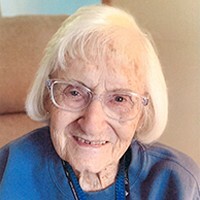 She passed away February 8, 2019 at Lakes Regional Healthcare at the age of ninety-six. She graduated from the Excelsior High School, attended the University of Iowa receiving her nursing degree and later continued her education at the University of Minnesota, receiving her Bachelors and Masters degree in Nursing. Ruth enlisted in the army where she served in the Army Nurses Cadet Corp during WWII. She worked as Director of Nursing at several of the Minneapolis Hospitals before joining the staff at Minnesota Nurse's Association. She was a member of the Westminister Presbyterian Church in Minneapolis. Ruth enjoyed birding, gardening, volunteering and animals, especially cats. She is survived by her sister, Pearl Godfrey of Spirit Lake; niece, Geralene Shuck and her husband, Joe of Arnolds Park; great-niece, Carrie Shuck of Kansas City along with other relatives and friends. She is preceded in death by her sisters, Grace Hass and Ruby Hass.